For years now, ball bearing disc brakes have been a favorite among riders who want control, durability, dependability and piece-of-cake adjusting. BBs adjustment knobs make quick work out of setting the perfect distance between the pads and rotor, as well as adjusting for pad wear. This is something you just cant do with hydraulic brakes. With gobs of beautifully modulated power and intuitive easy-to-use adjustability, the BB7s set the standard in the realm of mechanical disc brakes. 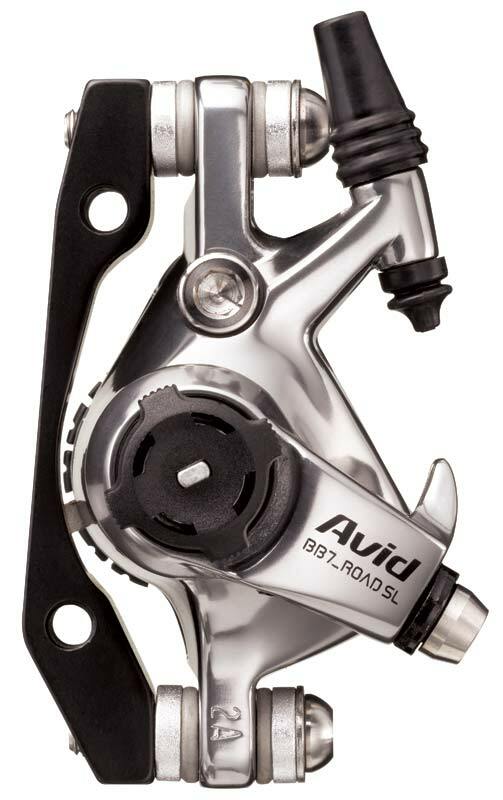 Inboard and outboard adjustor knobs, Tri-Align Caliper Positioning System, and integrated Cable Stop spring tension adjustment ensures that our standard is everyone elses goal. Aluminum-backed organic pads and Ti hardware save weight, and the SL version comes with HS1 heat-shedding rotors, Avid’s lightest. Rotor fits 6-hole bolt hubs. Calipers are 74mm and include adaptors for 51mm International Standard brake mounts. Designed to be used with drop bar brake levers. Available with 140 mm and 160 mm rotor diameters. Sold individually.